Well, here it is, middle age. I say middle because at 56 my life expectancy is 112. “MY” life expectancy that is. Never mind what statistics might say about 56 year old men, but I digress. So with half my life lived, I am becoming more and more aware of my mortality, and my legacy I suppose. I am a very proud father and stepdad to four wonderful young people, two of whom have expressed at least some passing interest in music. Great! But, they both gravitated towards the guitar, and don’t really have any real interest in Bluegrass. And they certainly have no interest in mandolins. I had always hoped that by imbedding them in a home filled with cool mandolins and ringing with bluegrass music that it would, I don’t know, stick? Click? Grow? Something. But it never really has. No one, except of course my awesome precious wife, in the house gives a flip about one of my biggest passions in life, mandolins. How sad. You know it’s not like the kids are anti-mando or anything. It’s more like they treat a great mandolin sitting in an open case ready to be picked with the same reverence they’d have for a tennis racket in a cardboard box in the garage. So you think you might have a very special thing to push through to the next generation. In the years to come you might hear, “Yea, this was my great Grandpa David’s mandolin that was made way back in 1997! And listen to how good it still sounds when I play it.” Dreams I guess. I have MY Great Grandpa Rankin’s fiddle and my Daddy’s guitar. They give me such pleasure touching and playing them. Makes me feel like I am reaching back through time, and almost touching the calloused finger tips of pickers in jam sessions in 1914 with Grandpa’s fiddle or 1951 with Dad’s guitar. (For me it’ll be, Hey wasn’t that dad’s old …”Tennis racket”?) Sorry, I majored in Sarcasm. So anyway, I got a few killer mandolins that the kids don’t really care about. Sure we could just sell them. We should sell them. 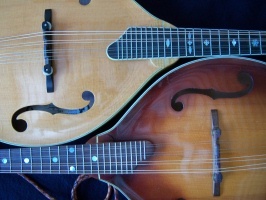 But somehow, to me, it seems like mandolins are worth more than money. Hard to know what that means unless you’re a picker. The value you’d derive from the sale of an instrument is less than the value you’d keep by retaining the instrument. If you sell a guitar for 500 bucks, you got 500 bucks. Period. But if you KEEP the guitar and take good care of it, you can play and enjoy it all the time you own it. AND if it is a quality instrument, in a few years it will be worth MORE than 500 bucks. You get the $500, and it is gone in a whisper to Wal-Mart, house payment, utilities, insurance, taxes, braces, GONE! So in the next 56 years, give or…well, just leave it at give, I will have to come up with a plan to get mando’s into the future hands of my…hey wait a minute…“GRANDKIDS”!?! ?